Figure below shows the circuit to obtain the samples of an analog signal. The switch shown closes periodically under the control of clock. The closure time of the switch â€˜tâ€™ is relatively short and the samples obtained are stored on the capacitor. 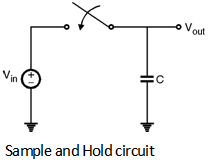 This circuit is known as Sample and Hold circuit. The S/H circuit consists of an analog switch that can be implemented by a MOSFET transmission gate, storage capacitor and a buffer amplifier. The sampled voltage levels are then fed to the input of A/D converter which provides an N bit binary number proportional to the value of signal sample. 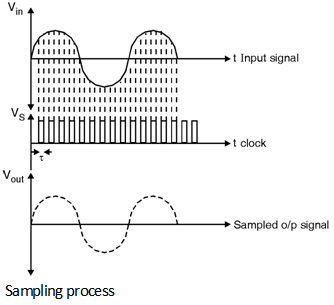 Figure below shows the input signal, clock and the sampled output signal of the S/H circuit shown in above Figure.